The compact, elegant silhouette of the Piaggero NP-32 is certain to catch your eye and make a lasting impression. Featuring a simple, practical design with only a few buttons, this space-saving stylish instrument can be played right out of the box. Choose from a black or white finish to suit your taste and playing environment. From the very first note, Piaggero will amaze you with its compact size and high-quality sound. It features a rich piano sound, sampled from one of Yamaha’s finest concert grands, together with a selection of other high-quality instrument voices. The NP-32 features a “Graded Soft Touch keyboard” with keys in the bass register having a heavier feel while the high notes are lighter. It's amazingly natural and expressive, and you can take it virtually anywhere to play. 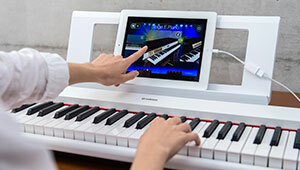 Yamaha offers a wide range of Apps for use with the Piaggero NP-12 including Digital Piano Controller, Metronome and NoteStar. You can connect your iOS device* to the USB TO HOST terminal** on your Piaggero or use the optional Yamaha UD-BT01*** wireless adaptor, for easy operation and added performance functions. 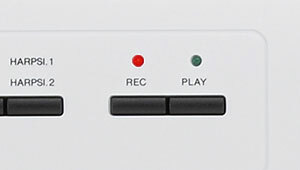 The Record button gives you easy, one-touch recording of your performance, great for practice and performance analysis.